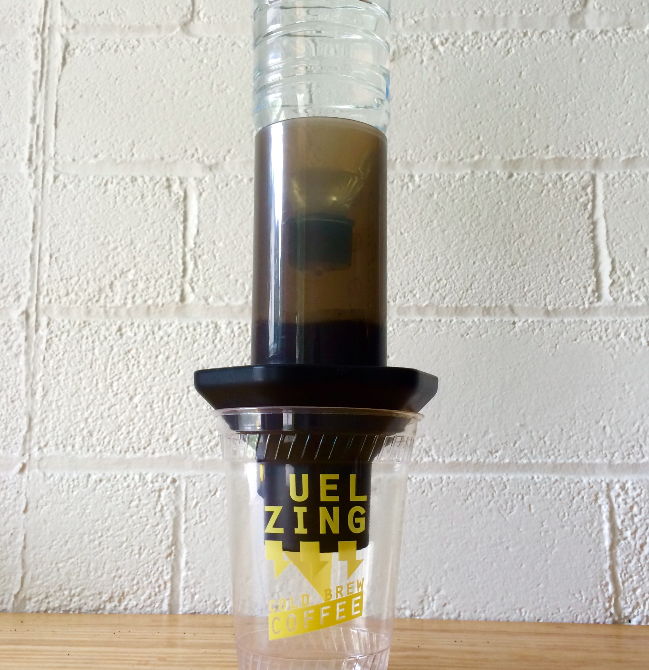 So the Aeropress was intended for versatility when it comes to brewing, but one method that the creator Alan Adler probably didn’t intend for was its ability to replicate a miniature Kyoto cold-drip tower. Kyoto is a cold brew method that draws its inspiration from the pour-over. With traditional cold brew, we rely on time to extract the coffee as it steeps in a full immersion with cold water. With Kyoto, we rely on gravity to pull water through a bed of grounds as fresh water is constantly being added until the desired strength is achieved. These differences in brew dynamics make a significant difference, especially on a small-scale brew. Cold brewing with immersion will always take around 24 hours when brewing in a refrigerator, regardless of batch size (a single cup all the way up to hundreds of gallons). 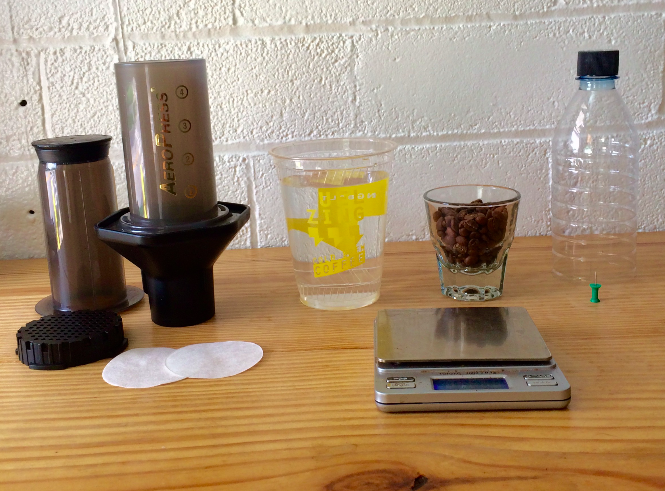 With Kyoto on the Aeropress, you can get a complex single cup of cold brew in as little as 3 hours! I know: that’s still a long time to wait for a cup of coffee, but hey it’s different and worth the try! You’ll need: an Aeropress, two filters, 400g of fresh water, 31.4g of coffee (I used our cold brew engineered Zing Blend), an empty bottle of water, and a thumbtack. First cut off the bottom of the water bottle so that it makes a funnel. Leave as much of the bottle as possible though, because this will be our water reservoir for the drip tower. Use the thumbtack to create a very small hole in the middle of the lid. Test your work by filling the bottle with water and observing the drip rate. You don’t need to get too caught up in a specific rate of drips per minute or anything—you’re just looking for a pretty constant drip that is not to an extreme on either side, i.e. a steady stream or drips more than 3 seconds apart. The goal is to provide enough water to keep the bed of grounds moist throughout the brew, without allowing a pool of water to gather atop the grounds. Next, assemble the Aeropress and rinse the filter. Add your freshly ground coffee and shake the Aeropress to settle the grounds. A good starting point for the grind is just a hair finer than what you would use for a pour-over. Now comes the toughest part: take the second filter and pre-wet it. Place this filter on top of the grounds. (It can be helpful to use the Aeropress’s stirring paddle to push the filter down, and cutting a thin rim around the filter before wetting it can help it to fit better inside the brewing chamber.) If a little bit of coffee gets trapped on top of the filter, it’ll be okay. Lastly, place the water bottle upside down inside the brewing chamber and fill with water. All that’s left now is to wait. It should take 2-3 hours at room temp. Once all of the water has made its way through the coffee, enjoy the final brew over ice. I found this brew method, once grind was dialed in, to be a bit lighter in body than full immersion brewing and the flavor profile of the cup to be more layered. It started light and sweet up front with the berry sweetness of the Ethiopian, then slowly faded to the fresh earthiness of the Sumatran, and finally finished with the milk chocolate base of the Nicaraguan. Of course, we’re partial to full-immersion cold brew (it’s our pride and joy! ), but you can never have too many ways to brew a cup of coffee—so play around and have fun!